The nerve cells generated by this method show the same functional characteristics as the mature cells found in the body, making them much better models for the study of age-related diseases such as Parkinson's & Alzheimer's, & for testing of new drugs. A new method of generating mature nerve cells from skin cells could greatly enhance understanding of neurodegenerative diseases, and could accelerate the development of new drugs and stem cell-based regenerative medicine. The nerve cells generated by this new method show the same functional characteristics as the mature cells found in the body, making them much better models for the study of age-related diseases such as Parkinson's and Alzheimer's, and for the testing of new drugs. Eventually, the technique could also be used to generate mature nerve cells for transplantation into patients with a range of neurodegenerative diseases. By studying how nerves form in developing tadpoles, researchers from the University of Cambridge were able to identify ways to speed up the cellular processes by which human nerve cells mature. Stem cells are our master cells, which can develop into almost any cell type within the body. Within a stem cell, there are mechanisms that tell it when to divide, and when to stop dividing and transform into another cell type, a process known as cell differentiation. Several years ago, researchers determined that a group of proteins known as transcription factors, which are found in many tissues throughout the body, regulate both mechanisms. More recently, it was found that by adding these proteins to skin cells, they can be reprogrammed to form other cell types, including nerve cells. These cells are known as induced neurons, or iN cells. However, this method generates a low number of cells, and those that are produced are not fully functional, which is a requirement in order to be useful models of disease: for example, cortical neurons for stroke, or motor neurons for motor neuron disease. 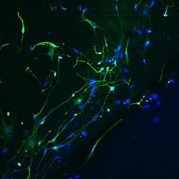 In addition, for age-related diseases such as Parkinson's and Alzheimer's, both of which affect millions worldwide, mature nerve cells which show the same characteristics as those found in the body are crucial in order to enhance understanding of the disease and ultimately determine the best way to treat it. "When you reprogram cells, you're essentially converting them from one form to another but often the cells you end up with look like they come from embryos rather than looking and acting like more mature adult cells," said Dr. Anna Philpott of the Department of Oncology, who led the research. "In order to increase our understanding of diseases like Alzheimer's, we need to be able to work with cells that look and behave like those you would see in older individuals who have developed the disease, so producing more 'adult' cells after reprogramming is really important." By manipulating the signals which transcription factors send to the cells, Dr. Philpott and her collaborators were able to promote cell differentiation and maturation, even in the presence of conflicting signals that were directing the cell to continue dividing. When cells are dividing, transcription factors are modified by the addition of phosphate molecules, a process known as phosphorylation, but this can limit how well cells can convert to mature nerves. However, by engineering proteins which cannot be modified by phosphate and adding them to human cells, the researchers found they could produce nerve cells that were significantly more mature, and therefore more useful as models for disease such as Alzheimer's. Additionally, very similar protein control mechanisms are at work to mature important cells in other tissues such as pancreatic islets, the cell type that fails to function effectively in type 2 diabetes. As well as making more mature nerves, Dr. Philpott's lab is now using similar methods to improve the function of insulin-producing pancreas cells for future therapeutic applications. "We've found that not only do you have to think about how you start the process of cell differentiation in stem cells, but you also have to think about what you need to do to make differentiation complete - we can learn a lot from how cells in developing embryos manage this," said Dr. Philpott. Illustration: These are mature nerve cells generated from human cells using enhanced transcription factors. –Fahad Ali.